Months ago I wrote a blog article on „How to write simple but sound Yara rules„. Since then the mentioned techniques and tools have improved. I’d like to give you a brief update on certain Yara features that I frequently use and tools that I use to generate and test my rules. In the past I was glad to see very specific strings in samples and sometimes used these strings as the only indicator for detection. E.g. whenever I’ve found a certain typo in the PE header fields like „Micorsoft Corportation“ I cheered and thought that this would make a great signature. But – and I have to admit that now – this only makes a nice signature. Great signatures require not only to match on a certain sample in the most condensed way but aims to match on similar samples created by the same author or group. 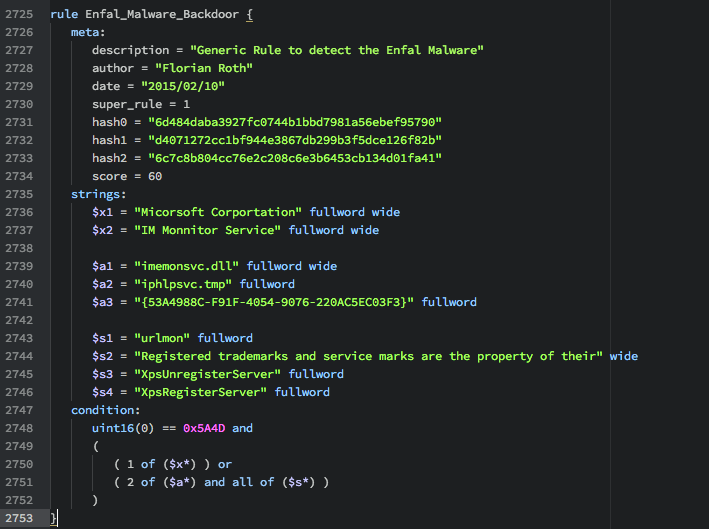 description = "Generic Rule to detect the Enfal Malware"
description = "Cobra Trojan - Stage 1"
One of the most underestimated features of Yara is the possibility to define a range in which strings occur in order to match. I used this technique to create a rule that detect metasploit meterpreter payloads quite reliably even if it’s encoded/cloaked. How that? Is it normal that these strings are located at this location in the file? Is it normal that these strings occur more than once in that file? Is the distance between two strings somehow specific? In case of the unspecific malware code in the PE overlay, try to define a rule that looks for a certain file size (e.g. filesize > 800KB) and the malware strings relative to the end of the file (e.g. $s1 in (filesize-500..filesize)). The following example shows a unspecified webshell that contains strings that may be modified by an attacker in future versions when applied in a victim’s network. Try always to extract strings that are less likely to be changed. The variable name „$code“ is more likely to change than the function combination „@eval(gzinflate(base64_decode(“ at the end of the file. It is possible that valid php code contains „eval(gzinflate(base64_decode(“ somewhere in the code but it is less likely that it occurs in the last 50 bytes of the file. description = "Detects b374k related webshell"
Performance Guidelines“. This guide shows you how to write Yara rules that use less CPU cycles by avoiding CPU intensive checks or using new condition checking shortcuts introduced in Yara version 3.4. People sometimes ask why I don’t use the PE module. The reason is simple: I avoid using modules that are rather new and would like to see it thoroughly tested prior using it in my scanners running in productive environments. It is a great module and a lot of effort went into it. I would always recommend using the PE module in lab environments or sandboxes. In scanners that walk huge directory trees a minor memory leak in one of the modules could lead to severe memory shortages. I’ll give it another year to prove its stability and then start using it in my rules. yarGen has an opcode feature since the last minor version. It is active by default but only useful in cases in which not enough strings could be extracted. 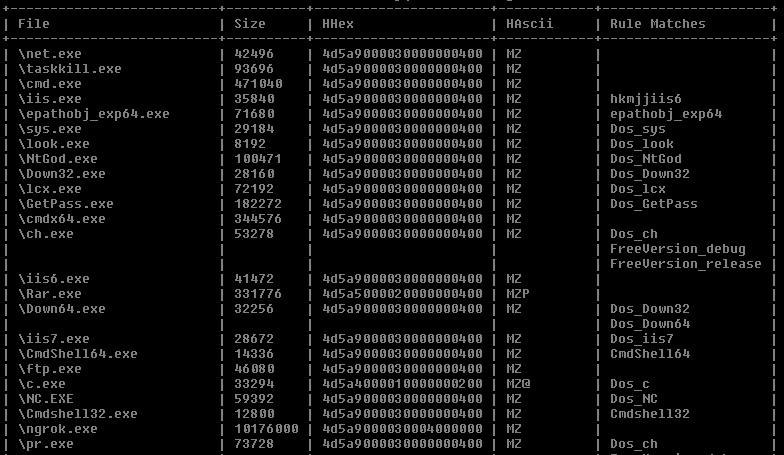 The problem with the opcode feature is that it requires about 2,5 GB more main memory during rule creation. I’ll change it to an optional parameter in the next version. 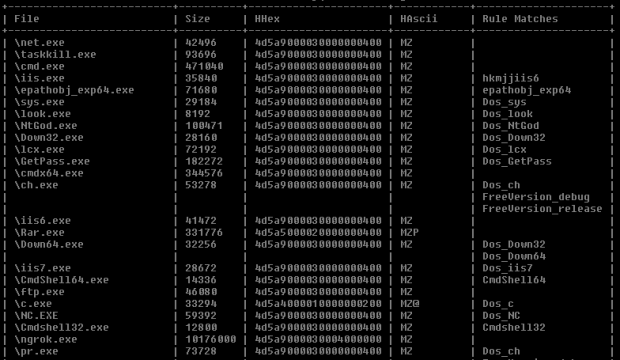 yarAnalyzer is a rather new tool that focuses on rule coverage. After creating a bigger rule set or a generic rule that should match on several samples you’d like to check the coverage of your rules in order to detect overlapping rules (which is often OK). To review the strings in a sample I use a simple shell one-liner that a good friend sent me once. 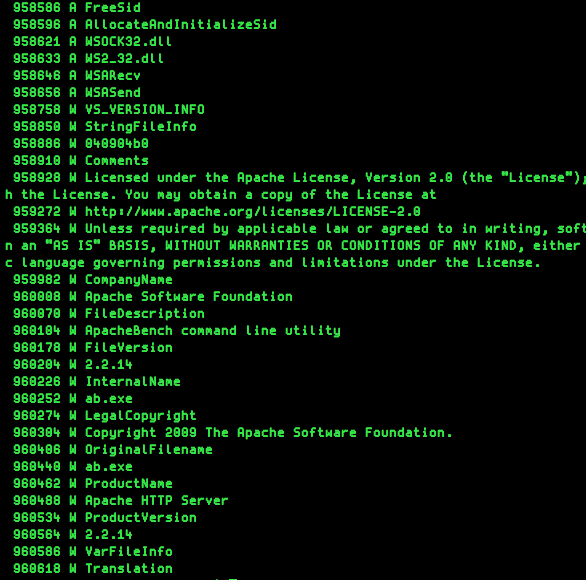 It produces an output as shown in the above screenshot with green text and the description „Malware Strings“ showing the offset, ascii (A) or wide (W) and the string at this offset. For a colorization of the string check my new tool „prisma“ that colorizes random type standard output.